We all know messaging is big right now – WeChat, Facebook Messenger, WhatsApp, Slack, Spark, the list goes on. It really all started with good ol, obsolete SMS. SMS is one of the big three that along with PSTN and email offers seamless interop. The sender doesn’t need to know which device, operating system, client, brand, vendor, and provider the recipient uses. The world learned to text with SMS – and it taught us some bad habits. We learned to be overly concise and abbreviated (“brb” for “be right back”) due to tiny keyboards, character limits, and costs. Oh, did I mention it’s only basic text? No wonder the world migrated to OTT apps that offer rich, unlimited, and free services. The carriers want texting to come back. Telecom has a long history of driving idiotic behaviors through cost avoidance – sometimes inadvertently killing the baby. After decades of overcharing, no one considers making a long distance call from a hotel phone any more. The world can’t get enough of these new OTT messaging apps. SMS sticks around because it’s so universal, but most of us drag our friends and teams to more powerful messaging options such as iMessage, FB Messenger, Slack, Hangouts, and others. That’s one answer. Another answer is RCS (Rich Communications Services). RCS is a “new” version of SMS. It’s been the “the next big thing” for over a decade. Unfortunately, it has been more of a concept than a service for several reasons – one of which being chicken and egg syndrome. The carriers don’t bother implementing it, in part, because there’s no demand or clients. There’s no demand or clients, in part, because there is limited carrier support. Google has a problem with Apple iMessage (actually Google has lots of problems and a messaging solution for each). It is hard to make Android better than iOS when iOS comes with a powerful rich messaging app. Google has a few approaches to rich messaging, but none involve carriers. RCS fills that gap. Google devised an impossible plan – to get RCS implemented by mobile carriers worldwide. Google worked closely with the mobile industry on its initiative to adopt RCS. This involved standardizing on an implementation model (the new universal RCS profile) because there’s lots of variables to the service. Google then courted providers to implement it (and has won over Sprint, Rogers, Orange, Deutsche Telekom, and Globe), and has its sights on the rest of the mobile industry. To solve the chick and egg – Google added RCS support to Android phones. For Android users that don’t get carrier updates, Google also offers Android Messenger in the Play store. I should also mention that Google is offering to host RCS services for the carriers with Google Jibe. Google acquired Jibe in September 2015. The final piece of the puzzle is programmable access to RCS. Business processes increasingly use SMS. Twilio and Nexmo (part of Vonage) have simplified access and lowered costs. RCS offers richer notifications and advanced features such as read receipts. 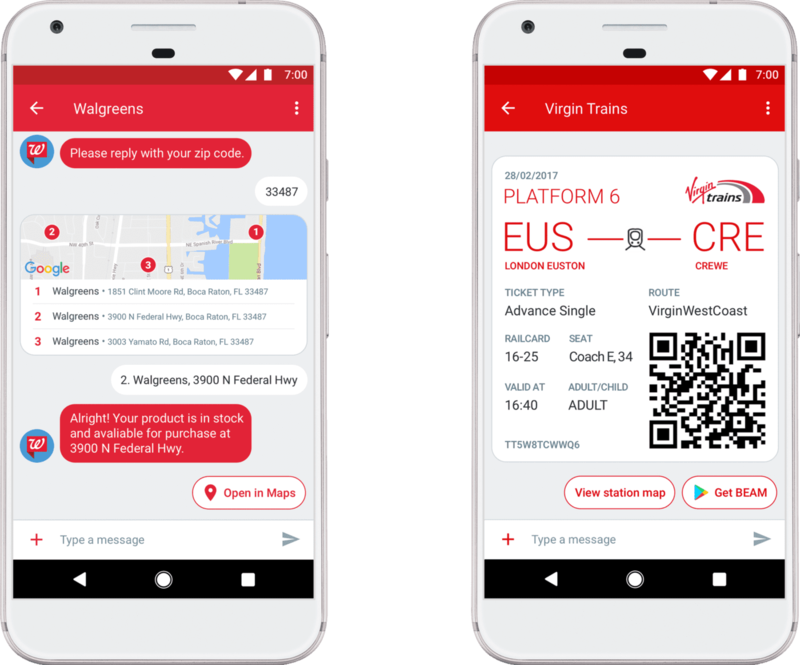 With RCS, for example, an airline can actually text a boarding pass instead of a link to a boarding pass. Google invited Nexmo/Vonage to its RCS coup and Nexmo already has a number of companies using the rich features of RCS (RCS automatically strips formatting for SMS recipients). Unlike SMS, RCS messages return read receipts by default, which is useful data for monitoring the effectiveness of the communication. It will have two-way messaging built in, eliminating the need for businesses to acquire short codes or long virtual numbers to facilitate that type of communication. RCS can connect directly to CRM systems, contact centers, or custom backends. It enables more interactive calls to action than SMS. For example, messages can contain one-click opt-outs, customer surveys, and real-time updates. Imagine an airline delivering a full, multimedia check-in experience within an RCS chat message, complete with boarding passes, visual flight updates, and on-demand terminal maps. Overall, RCS offers a much richer medium for businesses. With CPaaS ensuring reliable, high-quality message delivery, the protocol can unlock engaging new customer experiences for innovative enterprises. And carriers can recoup the decade-long investment they have sunk into RCS and offset some of the erosion they have suffered to consumer revenue due to the emergence of over-the-top apps by reaping RCS A2P revenue. This all sounds pretty good to me. I installed Android Messenger on my phone, but unfortunately T-Mobile doesn’t seem to support RCS yet. I suspect I am not the only one waiting. From what I can tell supply, demand, and features are lining up, and RCS just might be the next big thing in messaging. But RCS is new to me, so I turned to Dean Bubley at Disruptive Analysis for his opinion. Dean follows SMS, RCS, and other carrier services closely. He’s not as excited about RCS, and refers to it as a “zombie technology.” Check out our conversation below, and to learn more about Dean’s perspective see Dean’s RCS post.